Applying today's medical thinking to health and lifestyle advice from almost 150 years ago hardly seems a fair comparison. As Dr Don McMahon discovers, most medical writers of the late 19th century wilt under such scrutiny. So how do the writings of Ellen G White-who wrote without any medical training or background-stand up? Part scientific investigation, part personal journey, the book Acquired or Inspired? explores the writings of Ellen White in a way they have not been explored before. "Don McMahon has done an excellent thing. His project was initially fraught with danger, as he may have unearthed results which could have destroyed both his faith and that of others. It has been sometimes misunderstood by others and frequently criticised. This work honestly looks from a scientific and statistical viewpoint at an area taken as a faith issue and comes up with the splendid answer that there was no way Ellen White could have chosen the contents of her health writings from the knowlege of her time and been as accurate as she was in light of modern knowlege. These results even surpassed Don McMahon's original expectations. The chance of these varied statements being accurate when compared to the accuracy of her contemporaries, has been compared by McMahon to that of accidentally finding a coloured grain of rice mixed with several football fields of rice metres deep at the first attempt. The impossible becomes impossible when these chances are examined statistically. This is not a book in judgement on Ellen White, but a highly critical investigation which validates her position in Adventist belief and practice. 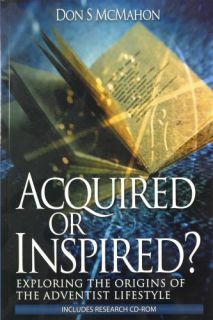 'Acquired or Inspired' is an honest publication written by a Seventh-day Adventist physician who is passionate about his church and its heritage. For the Seventh-day Adventist reader, it will strengthen faith in Ellen White as a person with a gift from God. For the person who is not an Adventist this book provides a challenge which is hard to ignore."